There were six cousins in the first place, joint heirs to a very considerable fortune. Then one was poisoned—by accident. A second was drowned—by accident. A third was run over and killed—by accident. And it was just about the time that a fourth cousin very nearly ended her days beneath the wheels of an Army lorry, that the whole matter was brought to the attention of Mr. Harvey Tuke—Senior Legal Assistant to the Director of Public Prosecutions. And Mr. Tuke, in a purely unofficial capacity of course, decided to investigate this chain of—shall we say coincidences?—with dramatic and intriguing results. 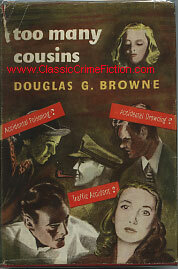 Douglas G. Browne is a writer who combines a clarity and soundness of plot construction with a friendly and most attractive manner of telling a story. The many who remember with pleasure his earlier books, also his numerous short stories in The Cornhill and similar magazines, will find in Too Many Cousins a high standard well maintained. To those who are meeting Mr. Browne—and Mr. Tuke—for the first time: we confidently commend this book as detective fiction of the first order.